Tickets are also available through TicketMaster and can be purchased at the door. The senior orchestra closes its season with an eclectic selection of works which showcase all sections of the symphony and which is guaranteed to please and amaze you. 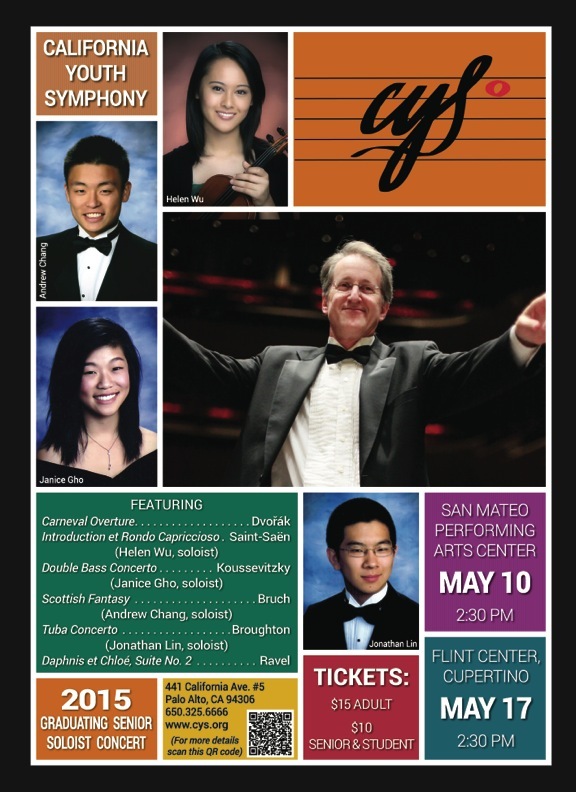 Our senior soloist competition winners, Helen Wu, Janice Gho, Andrew Chang, and Jonathan Lin will be spotlighted as guest soloists with the orchestra. Along with Dvorak's boisterous Carnival Overture, we conclude our season with one of the most important and beloved works of the early 20th century: Ravel's incomparable Daphnis et Chloé, composed in 1912 for the famous Ballets Russe and first performed in Paris that year. Thrill to the sheer orchestral mastery of Ravel as we end our season with this tour-de-force blockbuster! Helen Wu started studying violin at age four and joined the California Youth Symphony in fifth grade to cultivate her love for music in the midst of people who all came together for the same reason: to play music. In 9th grade, she became the concertmaster of the CYS’s Senior Orchestra and The Harker Upper School Orchestra. Since then she has had the opportunity to lead CYS in playing many great orchestral works like Rimsky-Korsakov’s Scheherazade, Strauss’s Don Juan, and Mahler’s Symphony No. 5. More excitingly, as concertmaster, she has toured and performed in London, New Zealand, and Eastern Europe, all of which she enjoyed thoroughly. Janice Gho began studying the double bass at the age of 13 with Bruce Moyer after many years of playing the piano. This is Janice’s third year in the California Youth Symphony, and her second year as co-principal bassist. Through her experiences with CYS, Janice has continuously been encouraged to participate in orchestras across the state and nation. Jonathan Lin started playing the tuba at the age of 11 and studies with Tony Clements. He enjoys sharing his music with the community and plays regularly in three music ensembles outside of school. A fourth year member of the California Youth Symphony, two as principal tubist with the senior orchestra, Jonathan is also a six year veteran of the Ohlone Tuba Ensemble. Last year he became a full member of the Mission Peak Brass Band as their principal Eb tubist. Each year CYS holds a competition for its current members to select outstanding graduating seniors to be provided with an opportunity to perform with the orchestra on its season finale concerts. Winning the Concerto Competition is considered one of the highest honors at the California Youth Symphony. While CYS is pleased to motivate and reward young musicians, the annual Concerto Competition is often more than a platform for students seeking a future in music. While many past winners have gone on to pursue music professionally, a number of competition winners have pursued education and careers in fields as diverse as biology, physics, and engineering. The California Youth Symphony considers it a pleasure to work with and inspire some of the leading minds of tomorrow and cultivate a lifelong appreciation of the arts as they become audience members of the future.